Lady Jane Grey had an excellent humanist education and a reputation as one of the most learned young women of her day. A committed Protestant, she was posthumously regarded as not only a political victim but also a martyr. 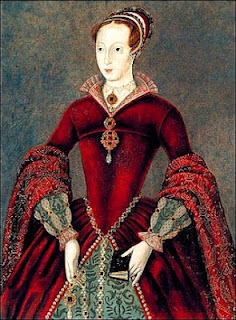 In early 1554 Queen Mary I sent John de Feckenham to seek to persuade her 16-year-old Protestant cousin, the Lady Jane Grey, of the truth of the Catholic faith, thereby avoiding execution. Feckenham was unsuccessful, and she was beheaded February 12, 1554. Feckenham. — How many sacraments are there? Lady Jane. — Two; the one the sacrament of Baptism, and the other the sacrament of the Lord’s Supper. Feckenham. — No, there are seven. Lady Jane. — By what scripture find you that? Feckenham. — Well, we will talk of that hereafter. But what is signified by your two sacraments? Lady Jane. — By the sacrament of Baptism I am washed with water, and regenerated by the Spirit, and that washing is a token to me that I am the child of God. The sacrament of the Lord’s Supper offered unto me, is a sure seal and testimony that I am, by the blood of Christ which he shed for me on the cross, made partaker of the everlasting kingdom. Feckenham. — Why, what do you receive in that sacrament? Do you not receive the very body and blood of Christ? Lady Jane. — No, surely, I do not so believe. I think that at the supper I neither receive flesh nor blood, but bread and wine, which bread, when it is broken, and which wine, when it is drunken, putteth me in remembrance how that for my sins the body of Christ was broken, and his blood shed on the cross, and with that bread and wine I receive the benefits that came by the breaking of his body, and shedding his blood for our sins on the cross. Feckenham. — Why, doth not Christ speak these words, Take, eat, this is my body? Require you any plainer words? Doth he not say, it is his body?